If Big Brother is really big can you trust the system? Coulson, May and Ward extract an agent from a dangerous undercover situation and intelligence is extracted from a chip up his nose. The team take the intel to the Hub, Shield's central base of operations, where it's classified. Agent Victoria Hand reveals to senior agents that a separatist group is planning to use a doomsday device. She needs a two-person team to sneak across the border and dismantle the device, Ward and Fitz have the necessary skills. Everyone is wary about Fitz going on a dangerous mission and Simmons makes him his favourite sandwich. Ward has a contact who can get them across the border, but he died and they're captured by local gangsters. Meanwhile Skye questions the secrecy and hierarchy of Shield and after Coulson refuses to answer her questions she convinces Simmons that Fitz and Ward are in danger. 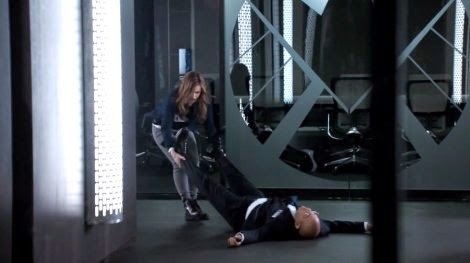 Simmons reluctantly helps Skye hack into Sheild systems, she is so nervous that she panics and knocks out a superior agent. Fitz saves himself and Ward by fixing the gangsters' generator so they take them over the border. There's trouble on the way and in the process Ward throws away Fitz's sandwich. Skye discovers that there's no extraction plan for Ward and Fitz, she confronts Coulson who didn't know about this and questions Victoria Hand. 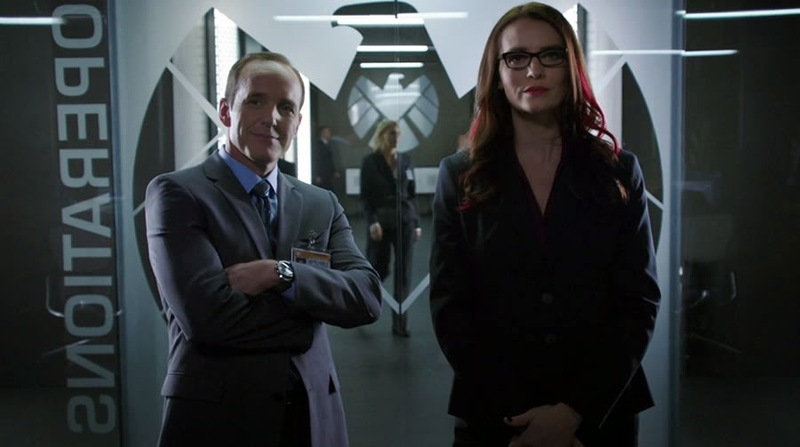 The female team members plan their own extraction, Coulson joins them. 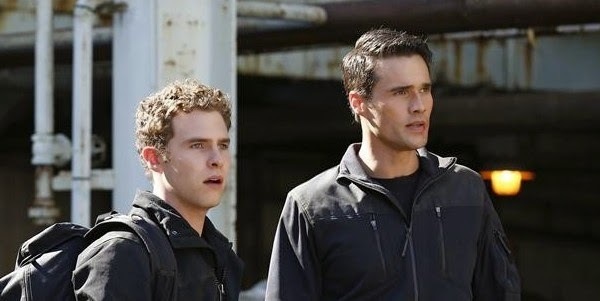 At the facility Fitz and Ward get to the device, and Ward realises they're on their own. He tells Fitz the situation and tries to get him to leave, but Fitz finishes the mission by disabling the device. Shield begins attacking the facility and the Bus comes for Fitz and Ward. Coulson tells Skye he looked into her past and a Shield agent dropped her off at the orphanage. Talking to May later it's clear Coulson hasn't told Skye everything. This is the first time we see Coulson as part of the wider Shield organisation. Even in the preceding films Coulson is usually working on his own or in a small team and it's only during bits of Avengers that he's seen in a bigger unit, and that's not a standard operation. Here Coulson is just the leader of a small team, outranked by others and only shown the part of the picture he needs to see. He knows exactly where he belongs here and I think that's a comfort to him, though he's more formal and official here. At first he preaches trust in the system to cynical, newbie Skye, and you can see how much this organsiation means to him. Coulson has changed since his death, as alluded to in every episode so far. His trust in his superiors and is shaken by Skye's revelation and his attachment to his new team. He not only confronts Agent Hand and objects to the planned op, he also joins May, Simmons and Skye in an unsanctioned incursion during a combat op. May plans an extraction with Simmons and Skye, intending to get in and get them out without getting in the way of the assault team. Coulson shows May everything he found about Skye's past and enlists her to find the truth. Ward is daunted/frustrated by the idea of protecting Fitz in dangerous territory. He expects Fitz to be useless and if he isn't irritated by him he seems at least indifferent to the engineer. Ward is shocked when Fitz turns out to be more resourceful and brave than expected. Fitz still has a lot to learn but Ward isn't interested in teaching, only explaining his actions if Fitz complains. The pairing is an interesting one, with Fitz's nervy chatter and sarcasm bouncing off Ward's stony,tactical silence. When Ward realises there's no extraction he tries to get Fitz to leave and save himself. Simmons is geeking out about being in the Hub, her commitment to the organisation similar to Coulson's, though at an earlier stage. She worries about Fitz going on a mission and makes him his favourite sandwich for the trip. Skye plays on Simmons' concern about Ward to get her help in hacking Shield, even though goody-two-shoes Simmons is flustered by the idea of going against protocol. She is so nervous about being caught and doing the wrong thing that when Agent Sitwell comes she is incapable of being cool or lying or talking like a person, despite Skye trying to help her. In her panic she shoots Sitwell with the night-night gun. Despite his clutziness and squeamishness Fitz is brilliant and turns out to be more resourceful than anyone expected. Fixing the generator gets him and Ward in with the border gangsters; the matriarch of the group finds him endearing and calls him 'Little Bear'. Ward is surprised when Fitz reveals he took the fuse out of the generator. Despite the resentful sarcasm and quiet frustration the two bond a bit. At the weapon Fitz is in his wheelhouse, and refuses to abandon the mission even after Ward gives him an out. Though even if he escaped the facility it's doubtful how long Fitz would manage out there on his own. While Ward is fighting off baddies Fitz helps by creating a weapons from parts of the device. Skye's first experience of Big-Shield, and ours, a bit awing. She bumps up against protocol, secrecy and literally the doors (thanks to her monitoring bracelet). She realises something is happening and tries to argue with Coulson, pushing against his adherence to the system even though she probably has won the team trust back after Girl With The Flower Dress. She's better at basic spy stuff, like lying, blending in, and observing, than Simmons. Then again Simmons has always comfortably existed inside the system whereas Skye's lived her life outside it. When Coulson tells her what he found she's so grateful for the info, which is sad as it turns out Coulson is conceal a lot. The weapon the separatists have sounds a bit weird/advanced, but that's not the focus. The true weirdness is Shield itself. As Skye comments, she didn't expect it to be so big. This episode compounds what we've seen so far and gives it scale and context. The ridiculously useful gadgets, not just what we've seen Fitz and Simmons work on but stuff like the infiltration tray-and-towel set Ward has in the first episode. The vehicles, the teams, the tech and the international scope of what we've seen (making the H in SHIELD particularly confusing). The separatists, I guess, but they're pretty faceless. Really, it's the system... man. "I can't be part of your bad-girl shenanigans." Simmons to Skye. I do kinda love Simmons. Agent Sitwell talks to Simmons when she's doing something she shouldn't and she melts down, completely. After Ward throws away his sandwich Fitz get's defensive about Ward's tough-guy role on the team. "You obviously get off on it, being the guy who always gets to throw the last punch, who always swoops in to save the girl. And now you've destroyed the world's most dangerous sandwich." ou obviously get off on it, being the guy who always gets to throw the last punch, who always swoops in to save the girl. And now you've destroyed the world's most dangerous sandwich. Simmons mentions the Triskelion to Skye as even more impressive than the Hub. When this was aired we hadn't seen the Triskelion yet and wouldn't until Winter Soldier. It's occurred to me that surely the Triskelion is too tall to be in Washington DC. It's Agent Sitwell! Hail Hydra! Him being evil is just the cherry on the cake of that hilarious scene. Victoria Hand is introduced and though she doesn't seem very sympathetic there's the suggestion that she knew Coulson would stick by his team. Given the upper echelons of Shield have got to be full of evil Hydra people it's probably no surprise she's pretty hard. Hierarchy, levels, compartmentalisation and top-down assignments and ops. This is how Hydra hides. The on-screen establishment of the organisation shows just how big a beast falls after Winter Soldier. Barton (Hawkeye) and Romanov (Black Widow) are mentioned as special cases who do not need extraction plans. They seem to be a special type of Shield agents. Phil no longer happy with protocol and methods. He's softened but also his priorities/perspective changed. This will inform the new Shield. Coulson stutters on "magical place" early on, and realises he's saying it. At the end tries to look into his own recovery, but has no access, increasing his mistrust in what he's been told. My thanks to @AlasdairStuart and @runalongwomble for the spoiler pun suggestions.